Where has "every man" John gone? POSSIBLE SPOILERS AHEAD. Y'all know how much of an action flick fan I am. I squealed with glee for most of Expendables 2; I frightened people who didn't know me during a the Super Bowl when the Fast and Furious 6 trailer came on; I enjoy the Die Hard movies immensely. (Yes, even the toned-down Live Free or Die Hard.) This latest film in the franchise, however, left me feeling totally flat. 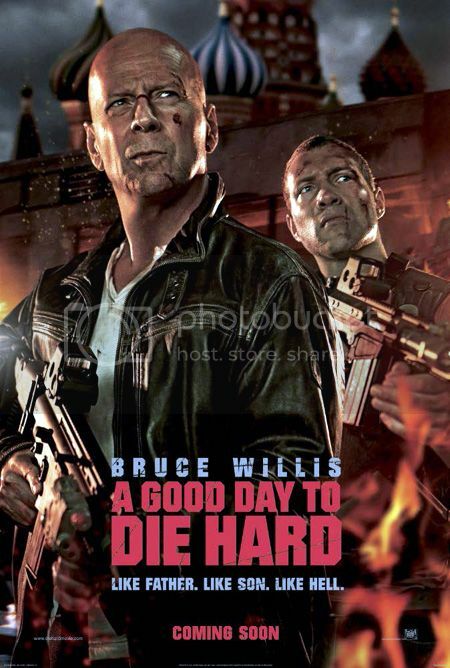 Gone are the days of John McClane being a regular Joe who, while minding his own business, gets caught up in something beyond his control. I could see the brief attempt to keep with the formula in A Good Day to Die Hard, but that was only within the first 10 minutes of the movie. And John wasn't so much forced into the fray as he stuck his nose into someone else's business. Bruce Willis was great in the role (as he is in pretty much every role), but his interactions (as John) with his son Jack (played by Jai Courtney) were so awkward and forced—and not in a good way. I understand that the McClane men are the sort of men that shake hands when they mean I love you, but the "lets bond before we go kill dudes" moments didn't work for me at all. The fixing of a broken father-son relationship was one of the movie's main plots, and it could have been done so much better. It also seems that the writers had a hard time coming up with a proper story and just threw in a gunfight or an explosion when they couldn't get a scene to work. I'm all for explosions, but when I walk out of a movie feeling like it was just one giant mushroom cloud, something's missing. (And yes—I know that the Expendables movies are pretty much one giant explosion, too, but I feel like the plots are at least a little less contrived.) See also: Plot holes. Even the inclusion of the iconic "yippie-ki-yay motherfu**er" couldn't redeem this one for me. One thing that I feel that they should have mentioned for the sake of the audience was the whole issue of radiation in Cherynobyl. I've seen enough specials to know that the radiation has dissipated quite a bit (though it's still not totally safe), but I feel like most people probably wondered why it was OK for those two to go running around in tight t-shirts while everyone else is in full radiation gear. When they used that compound to "neutralizes radiation" I just laughed. Also, and I could be wrong, but even if the area is relatively safe for short visits I think the materials and things in the buildings have absorbed and held on to the radiation quite a bit longer than ground and air did. And the "rainwater pool?" Nope, don't think I'd trust that. And to comment on the "spoilers" link: Yuri did tell them the "file" was in Pripyat and they said something about going to Ukraine, but I think they called it Ukrainia. As far as I know they do have it blocked off, but I'm not sure how strict they patrol the area around it. I don't believe they have guards stationed inside because of the dangers of long term exposure. And yeah, the boot-knife scene really confused me too. I asked Emily about it afterwards. Neither of us really understood how they both got loose. Yeah ... there's no way I'd feel comfortable after falling in that water. And I was questioning a lot of what was happening at that point in the movie, including the suits/no suits and the magic spray. I think Hollywood is like "No one goes to Russia, so why bother with accuracy?"